Dangerous weather can strike with little advance notice, so it’s important to have a system in place to warn of approaching storms. Whether you are indoors watching your children play in the yard or outside enjoying a round of golf you need to know when to the weather is taking a turn for the worse. 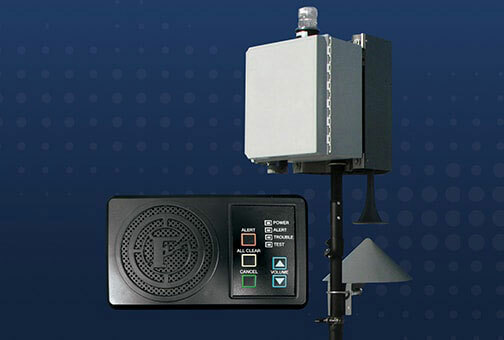 Earth Networks patented outdoor warning sirens combine a 100dBA horn with a 170,000 peak candela strobe light to let you know when there is approaching danger and action must be taken. In addition, our sirens are designed to provide 360o of audio and visual coverage for your safety. Even though weather happens outside, there are often people inside who have to react to it, either by issuing further instructions or sounding the all clear. Our warning sirens come with a fully integrated indoor control unit that can be wall-mounted or placed on a desktop so that updates can be issued to everyone as soon as they are received. When a severe storm rolls through, people start watching out for lightning. As part of our mass notification system, there is a fully automated lightning monitoring system which pinpoints where lightning is striking in your vicinity and can send automated email and text alerts to warn those in the area. By integrating in-cloud and cloud-to-ground lightning detection technology, this system assures that lightning is never going to take you by surprise, again. Knowledge is power, so use it to keep yourself safe. Lightning kills dozens of people in the U.S. every year. It often strikes during severe storms, but it has been known to strike when the sky is clear, too. With an outdoor weather warning siren in place, you can make sure people are aware of the dangers around them and can take the necessary steps to be safe.